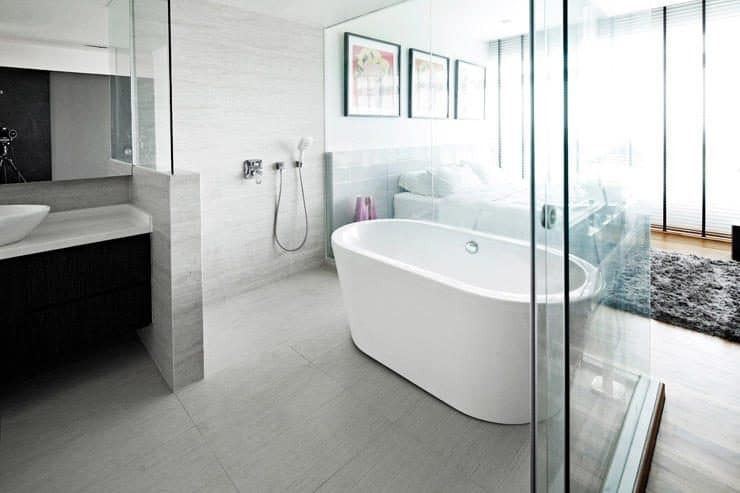 An open-concept bathroom is the latest trend hitting master bedroom suites. Not for the faint-hearted, but they are brilliant. Lana Hawkins explains. Washing up in the same room where you sleep used to be found only in low-budget motels and dorm rooms. But, in the last decade, the open-concept bathroom / bedroom design has become a must-feature in every luxury hotel around the world. The open-concept bathroom can be difficult to imagine, especially with our modern-day notions of privacy, so it’s naturally a topic that incites a lot of controversy in the world of interior design. Most designers and customers either strictly dislike the notion of an open-concept bathroom or are very intrigued by the proposal. If you belong to the latter group, here’s how an open-concept bathroom for the master bedroom can work. One of the most common challenges of an open concept bathroom/bedroom is related to morning habits and lifestyle. This can be a problem if you live with a partner whose daily routine doesn’t match yours. Openness means sharing the noise of shaving, showering, hair drying and everything else that’s involved in your morning and evening routine. However, if you live alone or don’t share your bedroom with other people, this problem of habits and lifestyle can be forgotten. 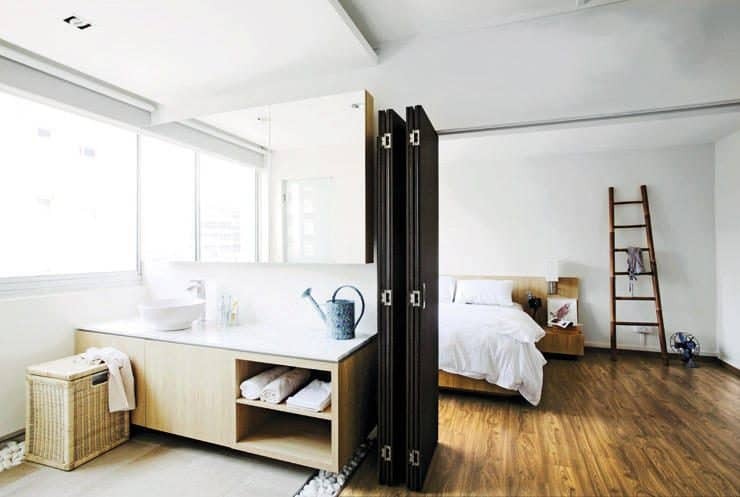 Privacy is a matter of personal preference, but somehow, bedroom and bathroom have always been perceived as the most intimate places of a home. No matter your views on privacy, the open bathroom concept is a bold move because you need to blur the line between the two rooms where you cherish your privacy the most. However, if you think things through and come up with a design that fits your needs well, there’s no reason not to go for it. The other primary challenge with an open-concept bathroom/bedroom is the toilet. Some people dismiss the open-concept right at the beginning because they think the toilet is in the open too. 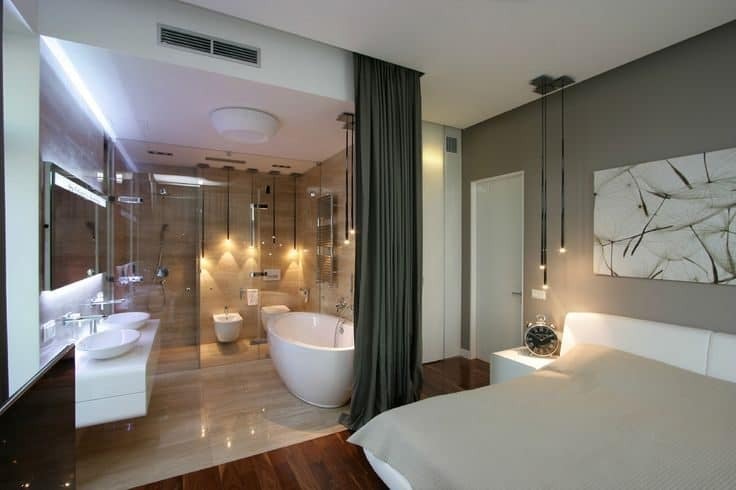 Don’t get the wrong idea, only the shower, the bathtub, the sinks and mirrors are included in the open bathroom concept. The toilet is usually placed in a dedicated room with walls and doors and appropriate plumbing. Historically, the toilet was never supposed to be the focal point of the bathroom. Even in closed bathrooms, the toilet should be hidden from the view. The eye should be directed to more beautiful features of the bathroom such as the vanity or the tub. Even though it might seem easy to make this separate toilet room yourself, it’s best if you leave it to the professionals. Contact any plumber in Western Sydney to install everything and set up the plumbing for your toilet. The so-called “open yet contained” layout can actually be the best solution for the open bathroom plan. This design provides the perfect ratio of privacy and openness many people seek. In order to achieve this look, designers usually add floor-to-ceiling alcoves, large pocket doors or sliding partitions that can transform an open space into a private room if needed. Another “open yet contained” element is the shower. The shower usually demands some means of containment, especially if it’s close to the bed. However, the degree of privacy is up to the user. The shower glass can be etched for more privacy, while still keeping that overall sense of openness. Creating zones is quite important in any open space. Actually, the more open the space, the more distinct zoning should be. The sink is another fixture that can act as a zone definer, and it can be positioned closer to the bedroom. A mirror can also be suspended to divide the space. A mirror can also be suspended to divide the space. Freestanding objects such as the shower or the vanity can each represent additional separate functional zones within the larger space. Such zones make the space look well-thought-out and better organized. Some experts claim that open-plan bathrooms are a natural progression from our open kitchens and living rooms. This trend also springs from the fact that we stopped seeing bathrooms as something shameful, but rather started connecting it with spa-like experiences. Maybe the open-concept bathroom is still too extreme for some people, so why not try a semi-open alternative. However, as trends and people’s needs change, one day, open-plan bathroom will probably be the most desired and widely-spread option, so start taking notes now.